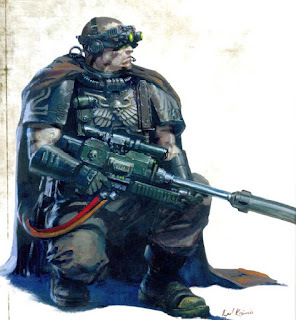 The ROW: Legion Recon Company, kinda falls in that category at first glance, but on deeper inspection, it looks like Raven Guard actually get some interesting Bonuses. Legion Recon Squads can be taken as compulsory troops. Anything deployed with scout or infiltrate get shrouding first turn. First off let's talk about the wording. It's written a little bizarrely, but basically you can take 2 troop choices that do not have the "support" designation. So that can be recons, breachers, assault marines, or tacs. THEN you have to take a 3rd troop choice that must be a recon squad. Anyway, what you get with the Legion Recon Company is a great first turn alpha strike formation that basically charges you a the cost of a recon squad as a tax in exchange for shrouding on your whole army first turn. But is that good? Well you kinda have to compare it to Decapitating Strike as it does many of the same things for Raven Guard. Luckily, I wrote a review of Decapitating Strike. They both give you re-rolls for first turn and deployment. They both restrict Heavy Support. Recon gives you re rolls on Seize the initiative. That said, you could always take Maun for this and probably did. So really what recon does is free up that Master of the Legion slot for a praetor. Interestingly, the subtle difference between the formations opens up a bunch of units that normally wouldn't be valued as highly when using the Decapitating Strike ROW. For example, units with scout get shrouding first turn. This makes all sorts of new units playable. Consuls: Unlike Decapitating Strike, there is no restriction to consuls. While this doesn't seem like a big deal, it does open the camoeline wargear to more units. Cameoline give stealth to the Independant Character AND his unit. Seriously though... A consul with a cloak is 5 pts more than upgrading a 10 man squad to all have cameoline! Vigilators: Give scout to units. AWESOME! But now, units with Scout get shrouding first turn. DOUBLE AWESOME!! Vigliators can also take jump packs. What? Yeah, it's often overlooked. So consider the potential of running Dark Fury Squads (which now all come with Raven Talon's for free) with Vigilators. TRIPLE AWESOME!!! Also works with your basic assault marines with melta bombs or your jump pack Destroyers. But wait! There's more. What about running them with attack bikes or jetbikes? Now add Jink ;) ALL THE AWESOME!!!! Outriders: Outriders some with scout. So they inherently pick up shrouding first turn, which is cool because they can jink as well. Plus, with furious charge and power axes they are Strength 6, which is especially interesting when you toss a Forgelord into the squad with rad grenades. So now you are oblitting multi wound T4 units. They are also a solid melta bomb delivery unit. Dozer Blades: Often overlooked but in this list it seems a good upgrade. Keeping Rhinos is cover so they get a 2+ cover save? That's huge. Consider what that means for your Mor Deythan with combi-flamers. Personally, I think this combo is so good you should largely run the Recon ROW as a rhino rush, but that's just me. Pretty sure it says they ARE compulsory, not can be taken as such, so you need 3 units of 30-point marines. "But wait! There's more. What about running them with attack bikes or jetbikes?" You can't do that, because Vigilators can't take a jetbike - or have I missed something? Nope Unknown. Its pretty clear that only the third compulsory choice has to be a recon squad. The other two can be the normal choices or more recon squads. @Neil: The vigilator could take a jump pack and cameleoline and keep up with the bikes. As long as he is in coherency it's all good. Yup. You take the jump pack with the Vigilator and attach them to the bikes. Only drawback to the vigilator with jump pack is he cannot take camoleIne. Still great to gain shrouded that first turn though.